Sweet-tasting foodstuff derived from certain plants; the most common varieties of sugar come from sugarcane and sugar beets. Fine, only slightly refined sugar crystals that still contain molasses; it has a stronger taste than white sugar. White or brown sugar in very large crystal form; it is used especially to sweeten fruits in brandy. Produced by reducing sugar maple sap; it is used to make various desserts and to accompany pancakes, poach eggs and glaze ham. Substance made by bees from flower nectar; its color and flavor vary depending on the nectar’s origin. 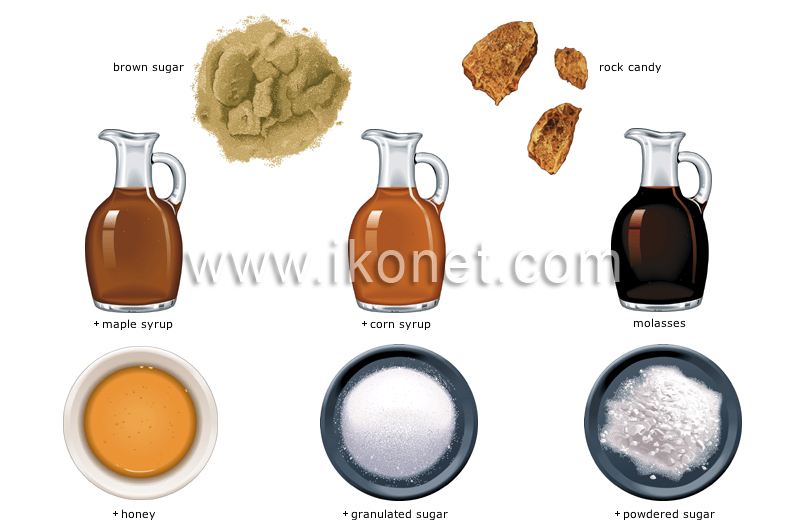 Thick sweet syrup used extensively in making candy and pastry. Thick liquid residue from the process of converting sugarcane into sugar; it is used to make rum, candy, soft cookies and pies. The most commonly used sugar in cooking and baking; it is white, fully refined and composed of small crystals. White sugar in powdered form, containing about 3% corn or wheat starch, added to prevent caking; it is used mainly for icing and decorating.